Mid and East Antrim Borough Council and Larne FC have completed one of the major football transfer deals of the summer, with the club’s purchase of its Inver Park home sealed. The club hailed the sale as a hugely significant day in the history of Larne FC. And they said work on phase one of the ground renovations, which will see the grandstand extended, installation of a new 4g playing surface and state of the art floodlights, are moving at a rapid pace and due to be completed ahead of the 2018/19 season. The process to purchase Inver Park saw the ground listed on the open market in February and potential investors invited to bid. Elected Members on Mid and East Antrim Borough Council agreed to proceed with the sale process and enter into formal negotiations with Larne Football Club (NI) Charity. Mayor of Mid and East Antrim, Councillor Lindsay Millar, said: “This is a positive step forward for both Larne FC, and Mid and East Antrim Borough Council. “Kenny Bruce and his team set out ambitious plans for the venue and a fantastic vision for the future of Larne FC and the local community. “Inver Park will be a hub of sporting activity to be used and enjoyed by the people of Larne. The club has been part of the fabric of our town for generations and this deal safeguards that affinity for generations to come. “By transferring ownership of the venue, Council will also receive a significant financial investment, which can in turn be used to support other vital frontline services, projects and initiatives locally. A buoyant Kenny Bruce said: “We are delighted that our charity’s offer to purchase Inver Park has been accepted and now finalised by Mid and East Antrim Borough Council. “We set a charity up to purchase Inver Park and the trustees will hold that asset for the Larne people so that it remains a centre for sporting excellence for hundreds of years to come. “Our attention is now on investment works on a new 4G playing surface and floodlights for the start of 2018-2019 season. 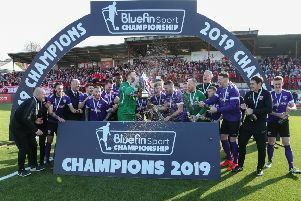 Chief Executive of Mid and East Antrim Borough Council, Anne Donaghy, said: “We have been working extremely closely with Mr Bruce and his team and I have been hugely impressed by his vision and ambition for Larne Football Club.